Moscovium atoms have 115 electrons and the shell structure is 2.8.18.32.32.18.5. The ground state electronic configuration of neutral moscovium is [Rn].5f14.6d10.7s2.7p3 (a guess based upon that of bismuth) and the term symbol of moscovium is 4S3/2 (a guess based upon guessed electronic structure). Moscovium: description Your user agent does not support the HTML5 Audio element. On 8 June 2016 IUPAC announced the new name moscovium (symbol Mc) for element 115 in place of the temporary systematic name ununpentium (Uup). A five-month review period expires 8 November 2016 to review this name prior to formal approval by IUPAC. On 10 September 2013 a paper published in Phys. Rev. Lett by D. Rudolph and others outlines additional evidence for the claims that fusion-evaporation reactions between 48Ca and 243Am ions lead to the 288Uup (288115) and 287Uup (287115). A total of thirty correlated α-decay chains were observed following the reactions. Experiments resulting in the formation of element 115 were reported in February 2004 following experiments carried out between 14 July - 10 August 2003 involving scientists at Dubna (Joint Institute for Nuclear Research at the U400 cyclotron with the Dubna gas-filled recoil separator, DGFRS) in Russia in a collaboration also involving scientists at the Lawrence Livermore National Laboratory, USA. Only four nuclei were identified and the claim has not yet been ratified, but the results are now published in a reputable peer-reviewed journal. 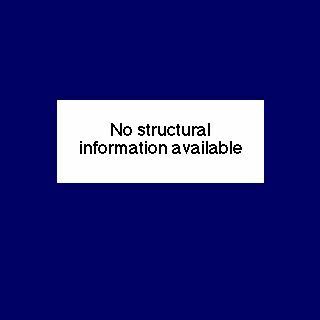 The solid state structure of moscovium is: bcc (body-centred cubic). As only a very few atoms of element 115, moscovium, have ever been made, it has no biological role. Reactions of moscovium as the element with air, water, halogens, acids, and bases where known. Binary compounds with halogens (known as halides), oxygen (known as oxides), hydrogen (known as hydrides), and other compounds of moscovium where known. Bond strengths; lattice energies of moscovium halides, hydrides, oxides (where known); and reduction potentials where known. Moscovium was discovered by (not yet confirmed) in 2003 at (not yet confirmed). Origin of name: for the element with atomic number 115 the name proposed is moscovium with the symbol Mc. This is in line with tradition honoring a place or geographical region and are proposed jointly by the discoverers at the Joint Institute for Nuclear Research, Dubna (Russia), Oak Ridge National Laboratory (USA), Vanderbilt University (USA) and Lawrence Livermore National Laboratory (USA).. 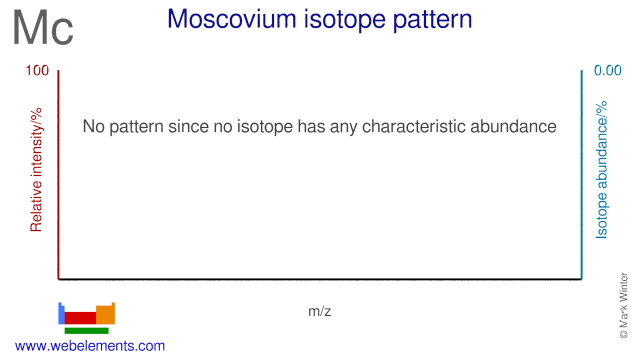 Isotope abundances of moscovium with the most intense signal set to 100%. Isolation: currently, the identification of element 115 is yet to be confirmed by IUPAC, but the experiments leading to element 115 are now published in a prestigious peer reviewed journal. As only about four atoms of element 115 have ever been made (through nuclear reactions involving fusing calcium nuclei with americium nuclei) isolation of an observable quantity has never been achieved, and may well never be. In these first experiments, three nuclei of the 288Uup isotope were made and one of the 287Uup isotope. All the nuclei formed decayed in less than a second by emitting α-particles. These decays resulted in isotopes of element 113 (mass number 283 or 284, containing 113 protons and either 170 or 171 neutrons). These isotopes of element 113 are also radioactive and underwent further α-decay processes to isotopes of element 111 and so on down to at least element 105 (dubnium).